In order to understand the origin of D.d. adhesion, Nadine Kamprad, Hannes Witt, Marcel Schröder, Christian Titus Kreis, Oliver Bäumchen, Andreas Janshoff and Marco Tarantola describe in their publication “Adhesion strategies of Dictyostelium discoideum – a force spectroscopy study”* how they realized and modified a variety of conditions for the amoeba comprising the absence and presence of the specific adhesion protein Substrate Adhesion A (sadA), glycolytic degradation, ionic strength, surface hydrophobicity and strength of van der Waals interactions by generating tailored model substrates. By employing AFM-based single cell force spectroscopy (using NanoWorld Arrow-TL2 tipless cantilevers) they could show that experimental force curves upon retraction exhibit two regimes described in detail in the article cited above. The study describes a versatile mechanism that allows the cells to adhere to a large variety of natural surfaces under various conditions. Fig. 2 A from “Adhesion strategies of Dictyostelium discoideum – a force spectroscopy study” by N. Kamprad et al. : Cell parametrization: β, angle between the normal on the cell membrane and the cell axis; R1, contact radius between the cell and substrate; R0, equatorial cell radius; R2, contact radius between the cell and cantilever, ϕ1 contact angle towards the substrate; ϕ2, contact angle between the cell and cantilever, in the background is a section of the confocal image in B. B: morphology of the carA-1-GFP labelled D.d. cell attached to the cantilever subjected to a pulling force of 0.2 nN. Open Access The article “Adhesion strategies of Dictyostelium discoideum – a force spectroscopy study” by Nadine Kamprad, Hannes Witt, Marcel Schröder, Christian Titus Kreis, Oliver Bäumchen, Andreas Janshoff and Marco Tarantola is licensed under a Creative Commons Attribution 3.0 International License, which permits use, sharing, adaptation, distribution and reproduction in any medium or format, as long as you give appropriate credit to the original author(s) and the source, provide a link to the Creative Commons license, and indicate if changes were made. The images or other third party material in this article are included in the article’s Creative Commons license, unless indicated otherwise in a credit line to the material. If material is not included in the article’s Creative Commons license and your intended use is not permitted by statutory regulation or exceeds the permitted use, you will need to obtain permission directly from the copyright holder. To view a copy of this license, visit http://creativecommons.org/licenses/by/3.0/. Atomic Force Microscopy is a powerful tool for evaluating cell mechanics. In the recent article “Vertical Light Sheet Enhanced Side-View Imaging for AFM Cell Mechanics Studies” by Kellie Beicker, E. Timothy O’Brien III, Michael R. Falvo, Richard Superfine published in Nature Scientific Reports, the authors combine sideways imaging and a vertical light sheet illumination system integrated with AFM to achieve their results. 5 µm polystyrene beads attached to NanoWorld Arrow-TL1 tipless AFM probes were used. Figure 5 from Beicker et. al Vertical Light Sheet Enhanced Side-View Imaging for AFM Cell Mechanics Studies: Membrane and nuclear displacements observed in response to force-rupture events between the AFM-tip and cell membrane. (a) Retraction portion of force-indentation curve with important points (A-G) identified. A, the point of zero force application to the cell, B-F, force-rupture peaks, and G, after bead releases from cell. (b) A closer examination of peaks E and F with sub-peaks of the E rupture event identified. No point is shown for E1 because this is the frame immediately following Peak E0. Inset indicates regions where displacement is measured between points E and F highlighted in green. 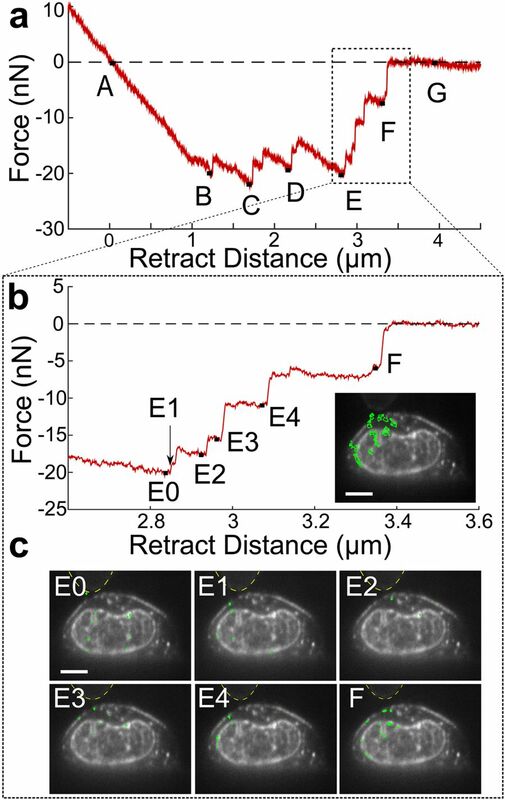 These regions were determined through difference imaging using frames taken at E and F. (c) Regions of cell displacements determined through difference imaging highlighted in green for the sub-peaks indicated in (b). Yellow dashed lines indicate outline of AFM mounted bead. Scale bars = 5 um. The article Beicker et. al, Vertical Light Sheet Enhanced Side-View Imaging for AFM Cell Mechanics Studies is licensed under a Creative Commons Attribution 4.0 International License, which permits use, sharing, adaptation, distribution and reproduction in any medium or format, as long as you give appropriate credit to the original author(s) and the source, provide a link to the Creative Commons license, and indicate if changes were made. The images or other third party material in this article are included in the article’s Creative Commons license, unless indicated otherwise in a credit line to the material. If material is not included in the article’s Creative Commons license and your intended use is not permitted by statutory regulation or exceeds the permitted use, you will need to obtain permission directly from the copyright holder. To view a copy of this license, visit http://creativecommons.org/licenses/by/4.0/. It will give you an overview of our the different tipless cantilevers offered by NanoWorld. These probes can for example be used for attaching spheres and other objects to the free end of the cantilever, or for functionalizing and sensing applications.